PIKES PEAK International Hillclimb is one of the few big-profile events that pits both bikes and cars against the clock and against each other. In the past, cars have had the edge. Half the track was unsurfaced, meaning four-wheel-drive, turbocharged monsters – some with as much as 1000bhp – were the fastest way to climb the 12-mile route to the 14,110ft summit. Last year the fastest car just broke the 10-minute barrier while the quickest bike was nearly a minute-and-a-half behind. But for 2012 the road has been fully asphalted, start to finish, and the results in yesterday's event were not only the fastest times ever set but ones that showed bikes really had the upper hand. OK, so the overall winner was Californian driver Rhys Millen in a 700bhp, turbocharged Hyundai Genesis, running on slicks and with enormous amounts of downforce. He completed the run in 9 minutes, 46.164 seconds, just pipping runner up Romain Dumas in his Porsche 911 GT3-R (again, a full-on racer) by 17 thousandths of a second. But third place went to Carlin Dunne, from Santa Barbara, on a Ducati Multistrada 1200, finishing in 9 minutes, 52.819 – well over a minute quicker than his victory last year on the old part-gravel road. His team-mate Greg Tracy on a similar bike was fourth, five seconds behind. Apart from some basic tuning and slicks, the bikes weren't far removed from stock. Those four were the only competitors to break the 10-minute barrier. 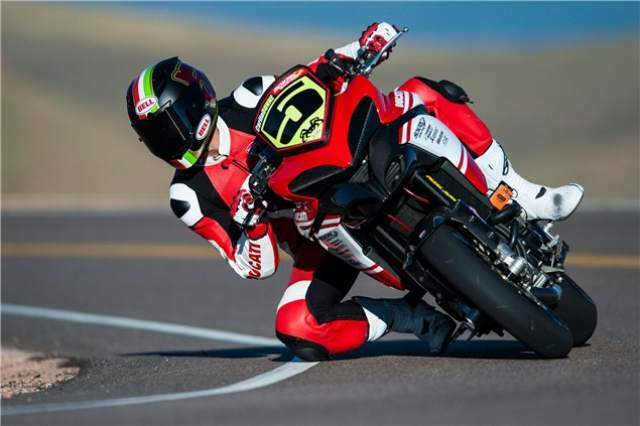 At the moment, Pikes Peak organisers aren't keen on allowing full-on sports bikes or dedicated race machines, denying us the chance to see what might be possible. A Yamaha R1 was allowed to run as part of an 'exhibition' class, but its 11 minute time suggests it wasn't being used to its full potential.